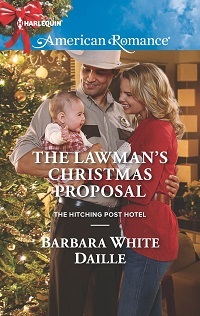 Today's featured book is The Lawman's Christmas Proposal by Barbara White Daille. Barbara's new series, The Hitching Post Hotel, features a matchmaking grandpa determined to see his three granddaughters wed. The series began with The Cowboy's Little Surprise, A Rancher of Her Own, and The Lawman's Christmas Proposal. Additional books in the series will be coming. Welcome, Barbara. Always happy to have you back. :) Happy Christmas! Hi, Kayelle - it's always a pleasure to visit! Thanks so much for sharing my Christmas books. I love this time of year, don't you? ;) Happy Christmas to you, too, and happy holidays to one and all!